Adeptus North Texas: New Citadel Paint System: A Hand Flamer of Your Own! 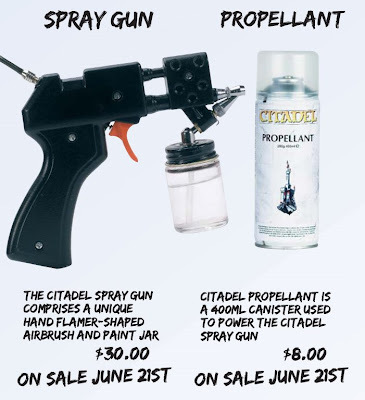 New Citadel Paint System: A Hand Flamer of Your Own! Games Workshop will release the most comprehensive hobby painting system in their history with the new Citadel Paint System this summer. If you have a comfort level with the Primers, Protective Coats, Foundation Paint and Citadel Paint colour ranges already available, you will find those items still available; to them, GW will add a specially-designed and fully-compatible Citadel Washes range, to add depth and highlights to your models...and the tool which will facilitate all of it is the new Citadel Spray Brush, designed to worth with each of these paint lines with as much ease as possible--and to look like a Warhammer 40,000 Hand Flamer, in the process (that would be a 'close combat weapon' variant to those who aren't Rogue Trader or V2 grognards). The Spray Brush *should not* be viewed as an airbrush, and will not be marketed as one. Although the technical principles are the same, airbrushes allow a vast range of painting functions and capabilities (at a considerably greater price and level of complication). The Citadel Spray Brush should, rather, be viewed as a 'base-coating brush,' an implement to deliver primer coats and basic-colour base coats to squads, regiments and other numerically large blocks of models, quickly and efficiently. To that end, mixing instructions for every kind of paint in the various Citadel ranges will be included with the brush...and as they are all acrylics, the mixing medium remains, simply, water. The nozzle on the Spray Brush will also have discreet settings that will allow modelers to 'set' the amount of paint coverage they want at pre-determined levels; and the Spray Brush can be connected directly to a compressor, if the hobbyist chooses (or has access to), but can just as easily be operated by easily-connectable cans of GW Propellant. Feel free to insert whatever smart comment about Games Workshop now literally selling hobbyists 'hot air' if you'd like...but grand hobby comedy aside, the idea behind the Spray Brush, the ranges of paints, and the compatibly-designed propellant cans is to provide access to a tool like this--which can be of tremendous benefit to a hobby for which painting large numbers of models is a critical component--to the vast majority of hobbyists who are not adept with, or even comfortable around, a more-sophisticated tool like a higher-line airbrush. It is an intermediate step from brush painting exclusively to mastering single- or double-action full-feature airbrushes. And, of course, at the end of the day...it is also a 1:1 scale Hand Flamer of your very own. What hobbyist doesn't secretly want that?